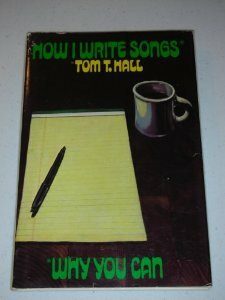 In this worthwhile albeit flawed first book, songwriter Tom T. Hall (“Harper Valley PTA,” “Old Dogs, Children and Watermelon Wine,” etc.) purports to explain how most anyone can become successful at his craft. Underlying the text is the assumption that mastering some simple “rules and tools” and learning a bit of music biz terminology will make composing as easy as A-B-C. It won’t, of course, and therein lies the main fallacy of How I Write Songs, Why You Can. If you haven’t got what it takes, no volume is going to put your name on the charts. If you do possess some basic songwriting talent, on the other hand, you may find much of Hall’s material to be obvious, irrelevant, or both. Moreover, even though the book runs less than 160 pages, it suffers from a plethora of filler. Hall features an interesting but only marginally relevant 20-page autobiography, for example; he includes an outdated map of Nashville’s “Music Row” and 10 pages of wholly unnecessary bad snapshots of himself; finally, while the inclusion of some of the author’s lyrics and sheet music was probably a good idea, the 16 pages of Hall compositions here seem a bit much. My strong objections notwithstanding, however, Hall’s book does deserve a reading by aspiring songwriters. As I’ve said, I doubt the author’s advice on getting ideas, rhyme, meter, and the rest can teach you much. But if you’re already on the right track, Hall’s volume can probably reassure and encourage you. At the least, it will certainly entertain.